Woman's corset c. 1730–1740. plain weave with supplementary weft-float patterning, stiffened with baleen. Los Angeles County Museum of Art, M.63.24.5. A corset is a garment that girds the torso and shapes it according to the fashionable silhouette of the day. Most often it has been used for cinching the waist and supporting the breasts. Some women tended to wear corsets tighter than necessary and buy corsets with smaller waists, but most women, although they purchased an 18 or 20 inch waisted corset left a gap at the back closure to accommodate a more realistic 22-26 inch waist measurements. On average that would mean a corset reduced the figure by only an inch or two at most. In fact, like today, in order to achieve the hourglass figure, many women took to adding volume to their bustlines to increase the ratio of bust to waist. Also, the full skirts, crinolines and bustles of the 19th century added to the width of the hips to make the waist appear slimmer. The earliest corsets were called "payre of bodies" and were usually worn with a farthingale that held out the skirts in a stiff cone. The payre of bodies, later called stays, turned the upper torso into a matching cone or cylinder. They had shoulder straps and ended in flaps at the waist. They flattened the bust, and in so doing, pushed the breasts up. The emphasis of the stays was less on the smallness of the waist than on the contrast between the rigid flatness of the bodice front and the curving tops of the breasts peeking over the top of the corset. By the middle of the 16th century, corsets were appearing as a commonly worn garment for women. These were made of stiffened multiple layers of linen with wooden busks or shafts that were inserted in a pocket at the front in order to keep the corset and figure straight. 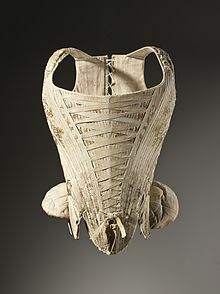 In this form, the corset survived until about 1860. The predominant forms of stays in the 18th-century was an inverted conical shape, often worn to create a contrast between a rigid quasi-cylindrical torso above the waist and heavy full skirts below. The primary purpose of 18th century stays was to raise and shape the breasts, tighten the midriff, support the back, improve posture to help a woman stand straight, with the shoulders down and back, and only slightly narrow the waist, creating a 'V' shaped upper torso over which the outer garment would be worn. However, 'jumps' of quilted linen were also worn instead of stays for informal situations. Jumps were only partially boned, did little for one's posture, but did add some support. Both garments were considered undergarments, and would be seen only under very limited circumstances. Well-fitting 18th Century stays are quite comfortable, do not restrict breathing, and allow women to work, although they do restrict bending at the waist (forcing one to protect one's back by lifting with the legs). Stays became much less constricting with the advent of the high-waisted empire style (around 1796) which de-emphasized the natural waist. Some form of stays was still worn by most women but these were often "short stays" (i.e. which did not extend very far below the breasts). By contrast, corsets intended to exert serious body-shaping force (as in the Victorian era) were "long" (extending down to and beyond the natural waist), laced in back, and stiffened with boning. By 1800 the corset had become primarily a method of supporting the breasts, as the waist was raised to just under the bust line. Corsets still slimmed the torso but this was not their primary purpose. When the waistline returned to its natural position during the 1830s, the corset reappeared and served dual purpose of supporting the breasts and narrowing the waist. However, it had changed its shape to the hourglass silhouette that is even now considered typical both for corsets and for Victorian fashion. At the same time, the term corset was first used for this garment in English. In the 1830s, the artificially inflated shoulders and skirts made the intervening waist look narrow, even with the corset laced only moderately. When the exaggerated shoulders disappeared, the waist itself had to be cinched tighter in order to achieve the same effect. The focus of the fashionable silhouette of the mid and late 19th century was an hourglass figure, achieved by reducing the thickness of the waist through corsetry. It is in the 1840s and 1850s that tightlacing first became popular. The corset differed from the earlier stays in numerous ways. The corset no longer ended at the hips, but flared out and ended several inches below the waist. The corset was exaggeratedly curvaceous rather than funnel-shaped. Spiral steel stays curved with the figure. While many corsets were still sewn by hand to the wearer's measurements, there was also a thriving market in cheaper mass-produced corsets. "Perfect Health" Corset c 1890. In the late 19th century concern about reports of tight lacing caused a movement for rational dress. Some doctors were found to support the theory that corsetry was injurious to health (particularly during pregnancy) and women who did tight lacing were condemned for vanity and excoriated from the pulpit as slaves to fashion. In reality, tight corsetting was most likely the cause of indigestion and constipation but rarely the cause for a plethora of ailments associated with tight corsetting at the time ranging from hysteria to liver failure. The straight-front corset, also known as the swan-bill corset, the S-bend corset or the health corset, was worn from circa 1900 to the early 1910s. Its name is derived from the very rigid, straight busk inserted in the center front of the corset. This corset forced the torso forward and made the hips protrude. The straight-front corset was popularised by Inez Gaches-Sarraute, a corsetiere with a degree in medicine. It was intended to be less injurious to wearers' health than other corsets in that it exerted less pressure on the stomach area. However, any benefits to the stomach were more than counterbalanced by the unnatural posture that it forced upon its wearer. The straight fronted corset was introduced to create the illusion of a slimmer waist by forcing the hips back and bust forward. This was thought to alleviate some of the pressure on the abdomen. However, by 1908 corsets began to fall from favour as the silhouette changed to a higher waistline and more naturalistic form. Early forms of brassieres were introduced and the girdle soon took the place of the corset which was more concerned with reducing the hips rather than the waist. A photo from Robert Wilson Shufeldt's 1908 book Studies of the human form for artists, sculptors, and scientists illustrates the narrowing of the waist achieved with a corset. From 1908 to 1914 the length of the skirt slowly sank from waist to ankles, necessitating the lengthening of the corset at its lower edge. A new type of fashionable corset covered the thighs and changed the position of the hip, making the waist become both higher and wider. The new fashion was considered uncomfortable, cumbersome, and furthermore required the use of strips of elastic fabric. Shortly after the United States' entry into World War I in 1917, the U.S. War Industries Board asked women to stop buying corsets to free up metal for war production. This step liberated some 28,000 tons of metal, enough to build two battleships. The corset, which had been made using steel stays since the 1860s, further declined in popularity as women took to brassieres and girdles which also used less steel in their construction. Corsets fell from popularity during the late 1910s but forms of body shaping undergarments often called corsets continued to be worn well into the 1920s. The change in the economy after World War I also changed women's role in society. In the early 20th century, a young lady would typically have started wearing a corset around age 15, and live at home until she married around age 18. After the war, more young women sought an education, and in the Western world marriage was delayed into the middle to late 20s. Only overweight or pregnant women might choose to wear a corset, typically an underbust corset. However, these garments were better known as girdles with the express purpose of reducing the hips in size. A return to waist nipping corsets in 1939 caused a stir in fashion circles but World War II ended their return. In the late 1940s they were revived and were popularly known as 'Merry Widows'. In the 1960s, 1970s and 1980s corsets remained a new revival. In the 1990s, fetish fashion became popular and corsets made something of a recovery, often worn as top garments rather than undergarments. By 2010, the corset had recovered a new popularity in fashion.